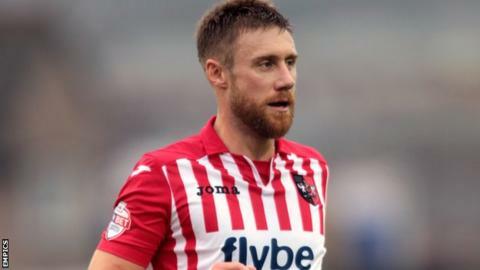 Exeter City are set to sign Oldham midfielder David Noble in a permanent deal next month. Noble, 32, has returned to Boundary Park after a three-month loan came to an end this week, having previously played for City from 2010-12. "We have to wait until January before we can register him," Exeter manager Paul Tisdale told BBC Sport. "You can't be certain of anything in football, but in principal, yes (he will return)." Noble made just two substitute appearances for Oldham after joining them in the summer following a two-year spell at Rotherham. And he returned to Exeter in September, playing 12 games for the club. The former Arsenal and West Ham youngster first signed for the Grecians in August 2010 from Bristol City.